In stock: two only, Last two! 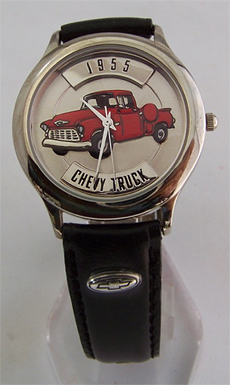 Click the button below to add the Fossil 57 Chevy Truck Watch Relic Chevrolet PickUp Wristwatch Vintage to your wish list. 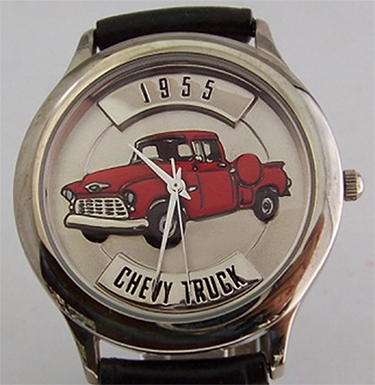 55 Chevy Pick Up Truck watch. New Fossil made Relic Collectors. 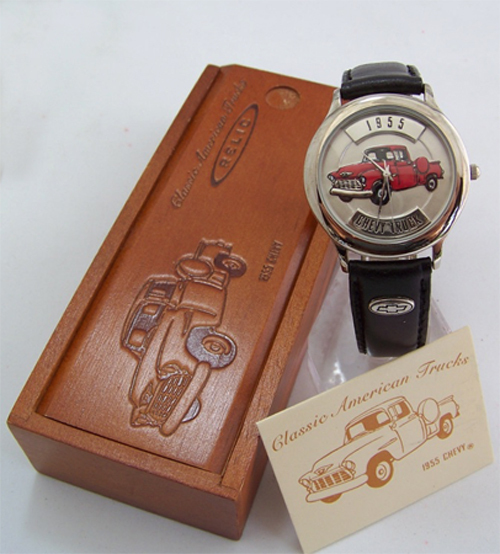 Mens 1955 Chevrolet Truck Wristwatch in Matching Slide Open Wood Box. Sold out Vintage Fossil Designed Collectible Novelty. New, unworn working collectible with matching wood box: only 2 left! 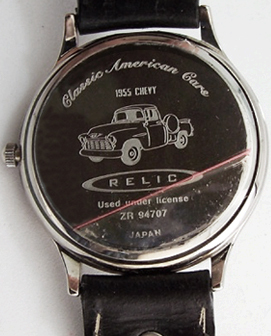 Fossil made Relic 1955 Chevy Pick Up Truck wristwatch. Classic Fossil design from their collectibles era. The face features a 3d detailed 1955 Chevrolet Red Truck with silver tone background. 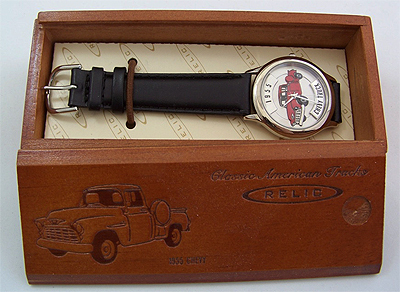 Released by Fossil in the 90s as part of their Classic American Cars series. Black cowhide leather band. Comes in a matching slide open wood box. Sold out novelty collectible wristwatch in new, unworn condition. Watch case diameter 36 mm. Band width 18mm. Quartz movement, three hand movement, analog display. New, unworn working condition.